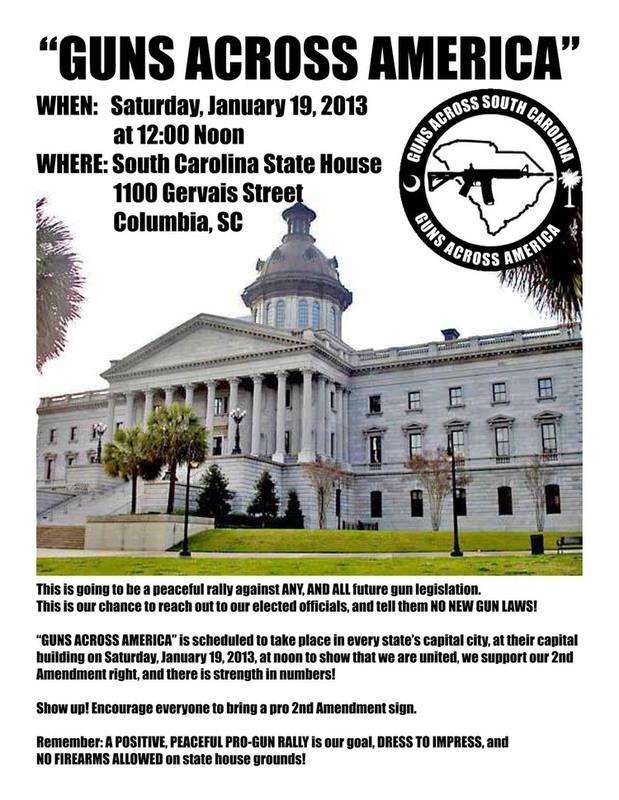 Columbia SC (January 19, 2013) – Local Second Amendment supporters in South Carolina will join forces for a national "Guns Across America" rally to be held at state capitals across the United States on Saturday, January 19, 2013 at 12:00 p.m. local time. According to Eric Reed, the national event coordinator, this event will be a "peaceful picketing protest against any and all future gun legislation." A family friendly event, the goal of the rally is to display the faces of thousands of law-abiding citizens who value the Constitution of the United States and the safeguards provided by the Second Amendment. This event is quickly gaining traction on social media outlets such as Facebook.com, where close to 6,500 individuals nationwide have signed up to attend through the "Guns Across America" main event page. Individual states, including Alabama, have also formed event pages to facilitate coordination of local efforts. The "Guns Across America – South Carolina" Facebook page has gained 100 followers in its first 36 hours. Numbers are expected to rise within the coming week.